Let's be honest. Most people don't even notice their sump pump until it's failed and their basement has a few inches, or feet, of water in it. 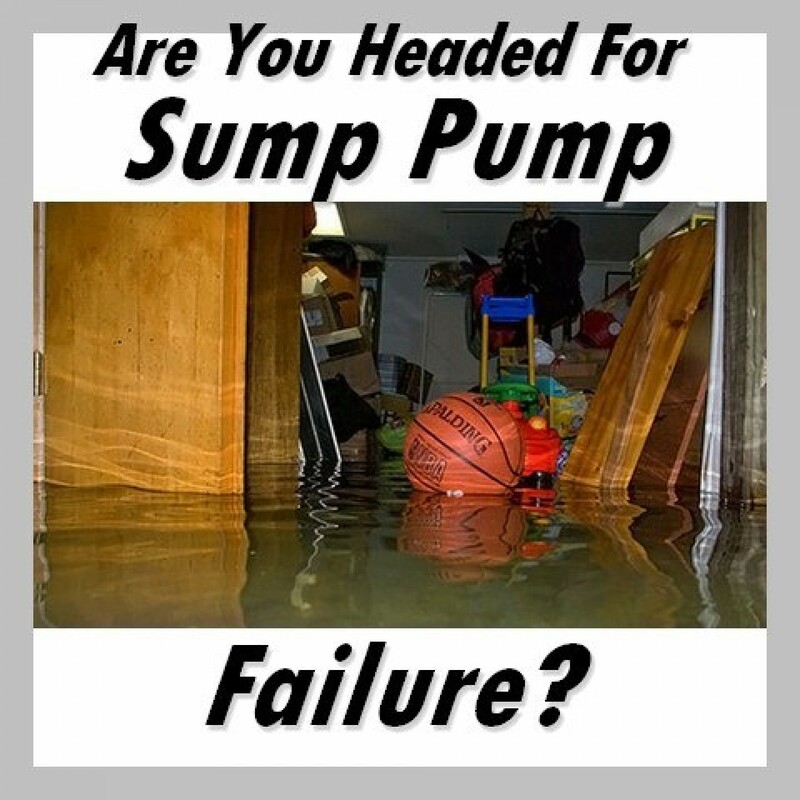 After late winter or early spring rains or when it rains all week, it's important to check your sump pump for signs of failure. 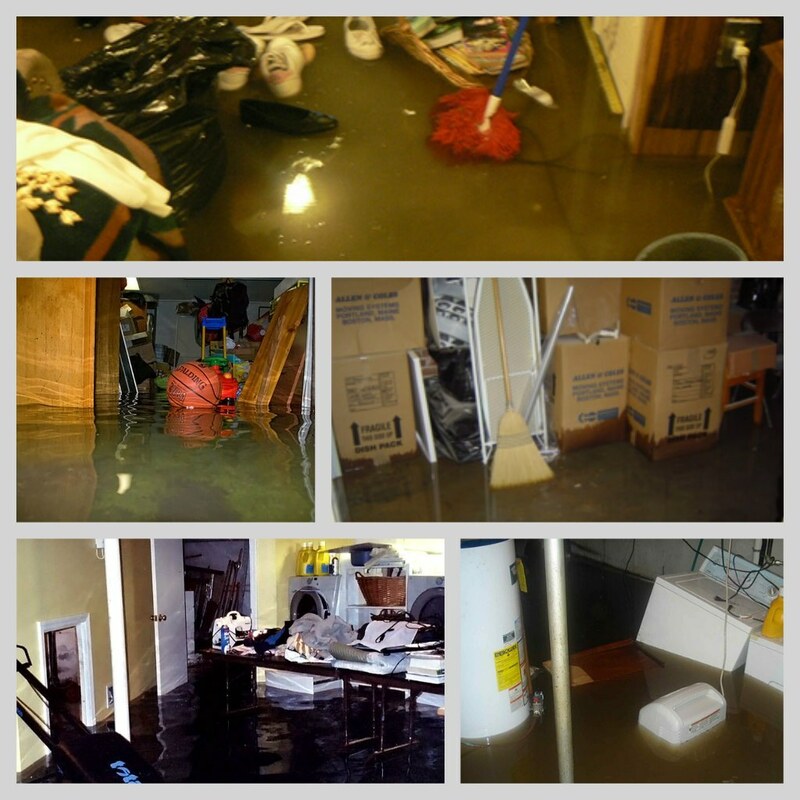 A sump pump is a small pump installed in the lowest part of a basement or crawlspace. Its job is to help keep the area under the building dry and to prevent it from flooding. Usually, sump pumps are installed in specially constructed sump pits. Sump pumps for home use are powered by electricity and use standard household current, so they don't require specialized wiring beyond a grounded outlet. Since the pump is always in or near water, it's a good idea to have a ground fault circuit interrupter (GFCI) on the outlet to prevent accidental electrocution. The same storm that floods your basement can also knock out the power, so having a battery back up is a good idea. • Age of the sump pump. Sump pumps generally last about 7 to 10 years: factors include how often the sump pump runs, the electrical source that powers it and the quality of the pump itself. • The pump’s mechanical parts become clogged with silt, or there is no pump cover so debris and silt accumulate, which increases the likelihood of slowing down or stopping. Cleaning your sump pit is an essential step in sump pump maintenance. To clean the sump pit, remove dirt, gravel, and other debris to increase the efficiency of the pump. Your discharge line opening should be free of obstruction so that the water can be pumped through the line and out of your basement/crawlspace. It's important to test your sump pump regularly to be sure your home is ready for the next big rain. To test the pump, pour a bucket of water in the pit. The pump should remove the water and shut off shortly after. You'll want to be sure the check valve and float aren't stuck. Jersey Plumbing Service, Call us Today, (908) 281-7101. 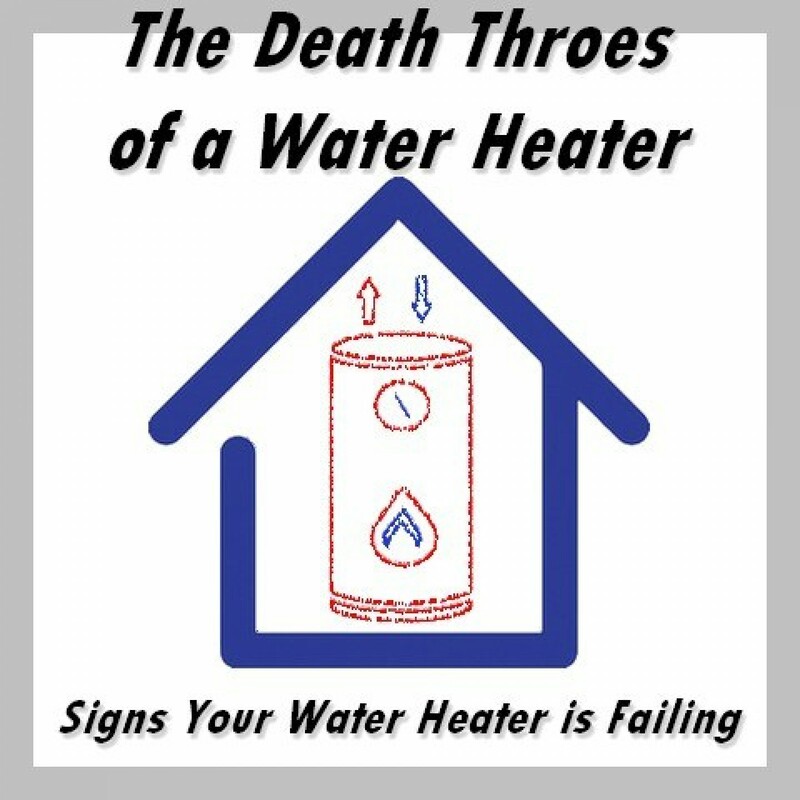 Even the best water heaters on the market will fail you eventually. Depending on where you live, the quality of water and the quality of your water conditioning equipment**LINK, your water heater may be headed for doom sooner than it was designed to. Hard and acidic water will lead to corrosion faster, but in the end, all water heaters will face the reality of worn out parts, cracked tanks or corrosion damage. If you’ve experienced a power outage, you already have a glimpse at how fun and exciting life will be without hot water. It’s a time of adventure and discovery: How will we wash the dishes? How will we wash our pots and pans? How will we wash ourselves? 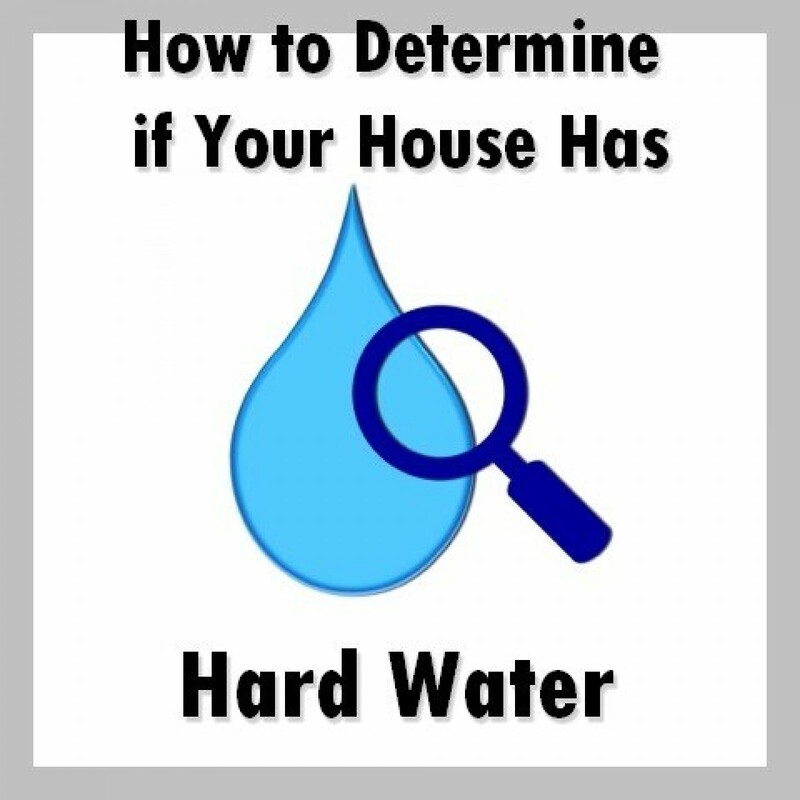 To prevent this experience, you’ll want to keep an eye out for the signs your water heater is failing. Age • If you don’t know how old your water heater is, you can verify the date with the serial number label. The month and date may be in an alphanumeric code, but the manufacturer’s website should provide you with the ability to decode it. Manufacturer information should also give you the estimated lifespan of your water heater. The current average (when lumping all models, new and old, in one heap) is 8 to 12 years. Modern replacements have a slightly better average at 12 to 14 years. Quick to Cool • If you notice that your water temperature isn’t as high as it used to be, or is running out a lot faster than usual, it’s possible your water heater is coated with mineral sediment. This tends to happen after about ten years. A licensed plumber **LINK should inspect your water heater. If you’re lucky – it’s just the heating element in need of replacement. Rusty Water • The anode rod in your water heater should be checked regularly and replaced when needed. This rod is meant to attract the corrosive elements in your water to the rod in lieu of your tank. If not replaced when needed, corrosive materials will damage the entire water heater, which will inevitably lead to rusty water. Rusty water could also be a sign of pipe damage, but the water heater is a likely villain when hunting for a rusty criminal in your plumbing. If it’s rusted to the point of red water, it’s time to say goodbye now – before it springs a leak. Water Everywhere • This is usually more a sign that your water has failed than a sign that it is failing, however, depending on the defect that caused it, your water heater may be salvageable. Snap, Crackle, POP • If your water heater makes loud pops has it heats, sediment has settled and hardened, causing your water heater to work harder. This results in a rapid expansion of the tank, and the loud banging noises that come with it. If your water heater shows any of these signs, just remember that Jersey Plumbing Service is just a phone call away. 1. Don’t block water supply valves or sewer cleanouts. If you have a plumbing emergency, the last thing you want to do is fight with 100 under-the-sink cleaners, artificial plants, furniture, waste-baskets and other household items to access various water valves as water spews into your home. 2. Don’t close a tap too tightly. When you close taps tightly, seals wear down faster. 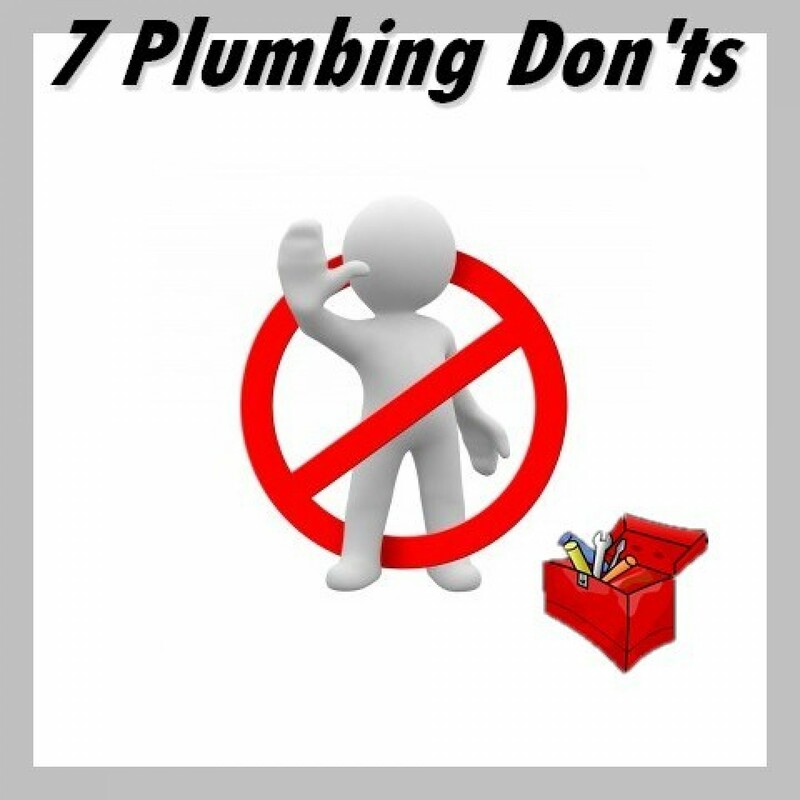 Be gentle with your plumbing fixtures to prevent the most common household leaks. 3. Don’t cut into walls, ceilings or floors blindly. You may be surprised to find out how many pipes are in the walls, ceilings and floors of your home. Don’t ever cut into something in your home without knowing what’s behind there. Aside from rupturing pipes, you could also be getting the shock of your life. 4. Don’t attempt a do it yourself plumbing fix on a Sunday or holiday. When easy plumbing fixes take a turn for the worse, having a plumber out after normal business hours can cost you more than your little project was budgeted for. 5. Don’t pour hot water into your toilet. Toilet bowls are usually very cold. A drastic change in temperature can crack the bowl. 6. Don’t store things near your water heater. Most people know enough not to store things near a furnace, but your water heater gives off an immense amount of heat as well. Be careful not to store anything too close to your water heater to prevent fires. 7. Don’t pour fats, coffee grinds or cooking oils into your drains. These waste materials can build up in your pipes, or in sewer pipes, causing blockages, backups, and sewer overflows. A little mindfulness can save you a lot of money over the life of your home. 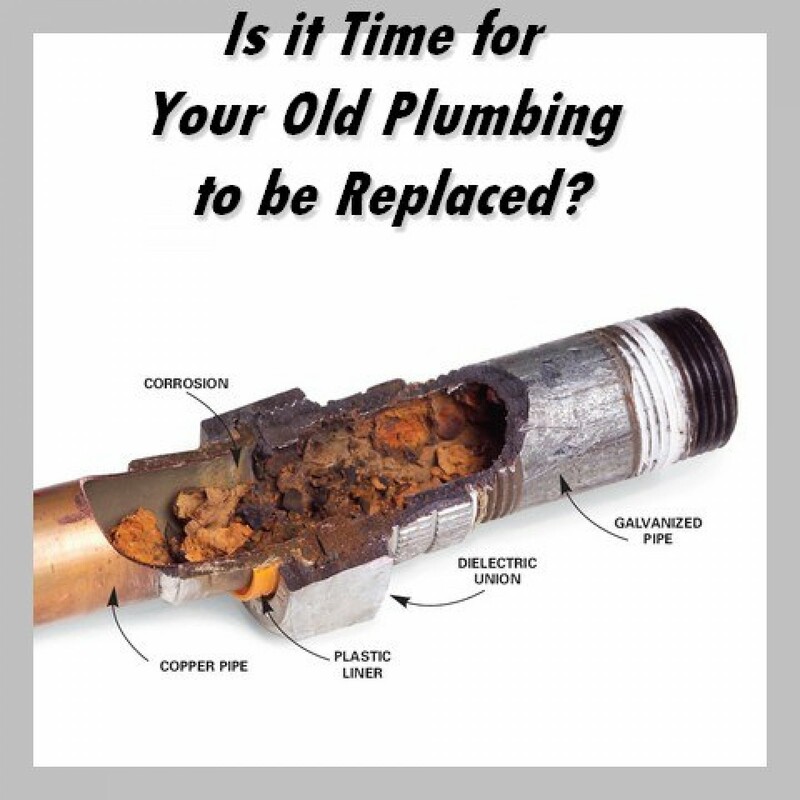 Is it Time for Your Old Plumbing to be Replaced? The age of your pipes is a factor in their eventual failing, but performance is everything. Each home has a different water supply. A home with more acidic water may wear out your pipes much faster than a home fed by a clean natural spring nearby. Your water supply should never smell. Most of the time, any odor coming from your pipes is indicative of bacteria growth. When pipes begin to scale, bacteria can start to gather and fester. This is a good sign a section of your plumbing may need to be replaced. A less common cause of odor is methane in the water supply. Methane is flammable and is not a welcome guest in any pipe system. Lastly is chlorine. If you smell chlorine, it’s not a sign that your pipes are failing, but it may be a motivating factor for improving your water conditioning system. Chlorine is actually recommended by the EPA to prevent the spread of bacteria and disease, but too much of is generally unpleasant. Dark water is an indication of corrosion in your pipes. As your pipes rust, the particles will be swept into the water supply, resulting in tinted water. Pipes with corrosion problems are more likely to clog, which can result in a burst pipe. Cloudy water is almost always a result of air bubbles, which is not a problem. Occasionally, cloudy water is from mineral or sediment deposits. Water with a lot of sediment is more prone to clogging your pipes. In rare cases, cloudy water can be a sign of methane gas, which may or may not have an odor. When your pipes start to leak behind the walls or in the ceilings, it may not become apparent until there are brown water stains on your walls/ceilings or a musty smell in any room of the house. When something smells “musty” what you actually smell are the waste products of mold. (Essentially, you smell mold farts.) Mold grows only in moist areas, so if you smell their byproduct, or see signs of mold on your walls/ceilings/floors, there’s a good chance you have a leak somewhere. Would you like to have your pipes professionally assessed? Contact Jersey Plumbing Service Today! Energy Efficient Products save homeowners big bucks over time. Our experienced Plumbers will guide you to the best energy efficient products available. Certain products come with federal tax incentives! 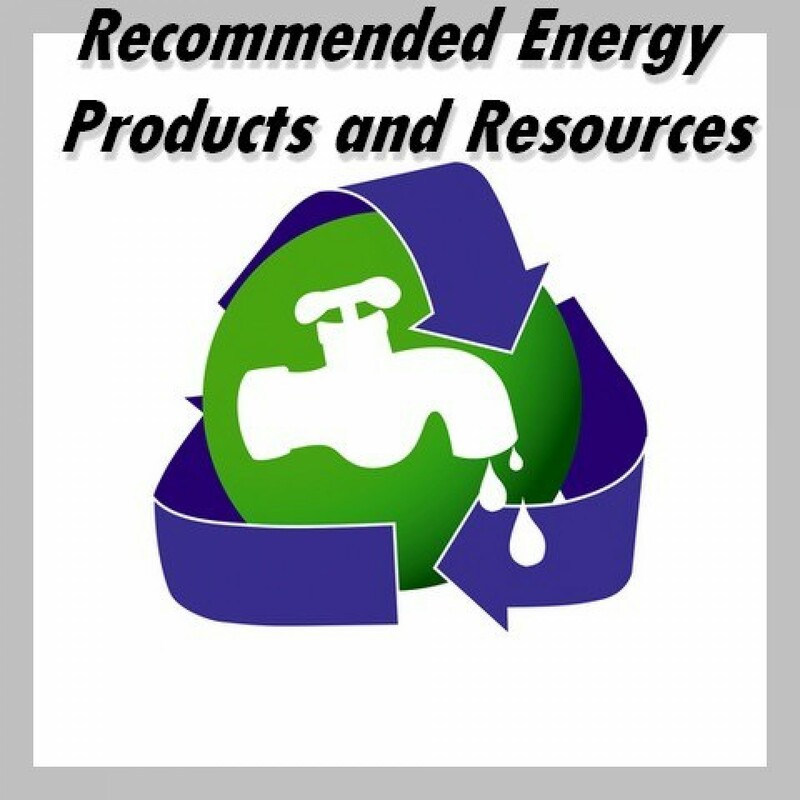 Find the form for your energy efficient product at energystar.gov. Check out our Brands & Products page for systems we recommend.